With Glittering Eyes: "Buddy The Elf - What's your favorite color?" "Buddy The Elf - What's your favorite color?" 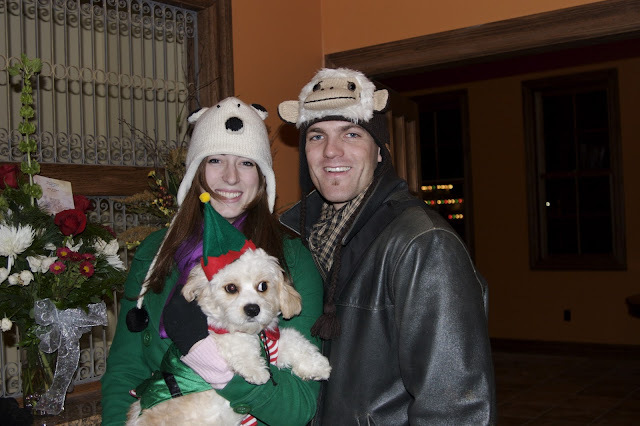 Here's our little family warming up in the Main Street Inn lobby. We decided to debut our new accessories at the Lowell Christmas parade on Saturday. A polar bear, a monkey, and Buddy the elf! Hahahaha! That is awesome...Buddy the Elf! I love it! You're hats are cute too!